Pete Rose was all about his Cincinnati hometown during his Reds Hall of Fame induction speech. 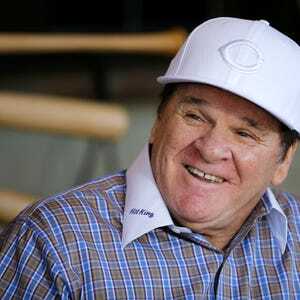 Pete Rose grew up playing baseball on hot, sunny Cincinnati afternoons such as Saturday. And, the town’s favorite sports son made it mostly about his home city as Rose was inducted into the Reds Hall of Fame. “To date, this is the biggest thing ever to happen to me in baseball,” said Rose, whose remarks were answered several times by applause. The only time Rose’s voice wavered was during comments such as those, when he got personal. Rose, a product of Western Hills High School, alternately cracked wise and praised his many baseball influences, from Knothole managers to coaches to former teammates. Reds President and CEO Bob Castellini formally inducted Rose, with longtime Reds radio voice Marty Brennaman acting as emcee and welcoming his “dear friend” to the Hall. About 25 Reds Hall of Famers sat nearby on the field, wearing their red Hall jackets as Rose spoke at a podium. 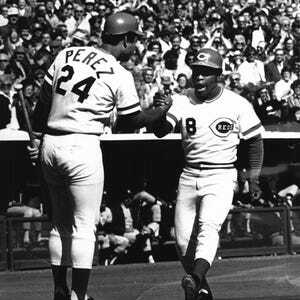 The generations spanned from Rose’s early Reds years (Leo Cardenas, Jim Maloney, Tommy Helms and more) through the Big Red Machine era (Johnny Bench, Tony Perez, George Foster et al.) and beyond (Jose Rijo, Eric Davis, Chris Sabo and more). Rose’s lengthy pre-game speech nearly spilled into the Reds’ scheduled 4:10 p.m. start against San Diego. In fact, the game's start was delayed until 4:16 p.m.
Rose in 1989 was handed a lifetime ban from baseball, for betting on games. Commissioner Rob Manfred upheld the ban this past December. Then, it was announced in January that the Reds Hall of Fame board of directors voted unanimously to change the bylaws and elect Rose to the team’s Hall of Fame, as well as retire his number 14. 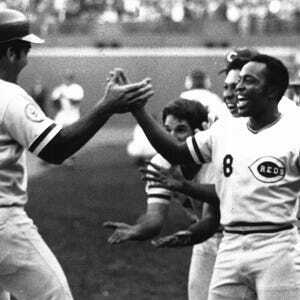 Rose is baseball's career hits leader with 4,256, and was captain of the 1975 and '76 Reds teams that won World Championships. The Reds' board, with Manfred’s blessing, bypassed its usual selection process that involves fans and media voting to make Rose the lone inductee in 2016. “God bless the Commissioner of baseball,” Rose told the crowd, which thought about it briefly and then applauded lightly. Otherwise, it was mostly Cincinnati. 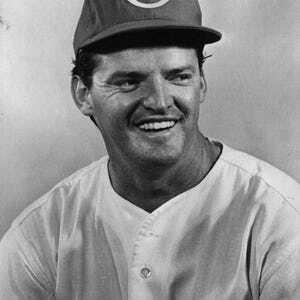 Rose mentioned several other former Reds who were either born in Cincinnati or spent their formative Knothole baseball years in the city. Castellini responded with a thumbs-up. A Rose statue is scheduled for next year at GABP. The induction continued a Rose weekend that included the 1976 World Series champion Big Red Machine team honored in pre-game ceremonies Friday night. Rose’s number 14 will be retired Sunday. -Reds vs. San Diego Padres, 1:10 p.m.